You will find on these pages the celebrity horoscopes having the 4th House in the 12 signs with an interactive chart and excerpts of astrological portrait. The 4th house, referred to as the Imum Coeli: family, home, origins, heredity, and the father. It represents the native's family, ancestors, roots, and home, both the home he comes from and the one he will set up. This house also describes the real estate patrimony, childhood, and emotions. It is located at the bottom of the chart, and like the Ascendant, it is an angular house. For some authors, 4th house represents the mother instead of the father. 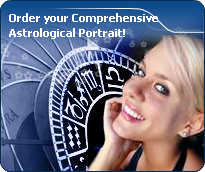 The fourth astrological house is in analogy to the fourth sign of the zodiac, Cancer.